One thing I've always disliked about buying my daughter books is that once she reads them they get tossed on a bookshelf to collect dust never to be touched again. I try to support her love of reading, but much rather if she borrows books from the library if she's only going to read them once. These books however aren't "just books". They are books with extra purpose that keep kids coming back to them over and over. From Glow-in-the-dark stickers to necklaces with reptile teeth to figures of how sharks and humans look like on the inside. Each book as a special added bonus that kids can enjoy with or without the books. And the books teach them about things they probably already want to know more about. Things they are probably already learning about in school even so they will fit in perfectly. Go on an electrifying journey to see how these living lights use bioluminescence, fluorescence, and symbiotic bacteria to light up! Amazing World: Sea Creatures reveals the fascinating lives of twenty strange and amazing marine animals and includes glow-in-the-dark stickers! From stellar nurseries, to glowing green clouds, to spiral galaxies, find out about the dramatic lives of these explosive players in our universe. This is the perfect introduction to the great celestial bodies of outer space for science lovers and their children. Kids will love the gorgeous, bright images, and will also learn quickly from the easily digestible bites of information on each page. Includes a collection of glow-in-the-dark stickers to put on notebooks, folders, bedroom ceilings, anywhere! Do you believe dragons are simply the scaly stuff of myths? Or do you think they really existed? Whatever side you're on, this collection of twenty fascinating creatures is sure to spark your imagination. From the deadly gaboon viper—with the longest fangs in the world—to the venomous Gila monster that lurks underground, reptiles have an extraordinary assortment of survival skills. Fangs and venom aren’t these cold-blooded creatures’ only weapons: some are camouflaged to hide in plain sight, and others, like the Komodo dragon, have powerful claws for slashing prey. 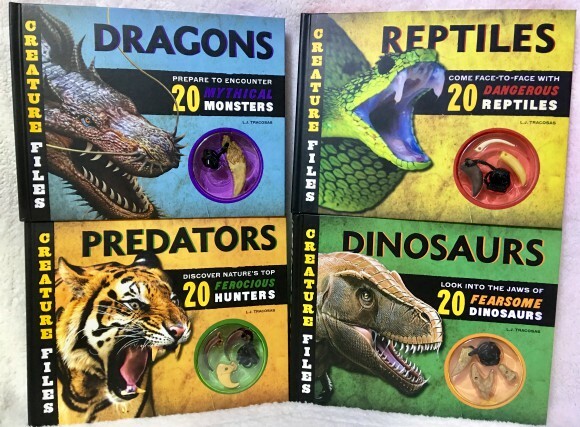 With stunning photos on every page, Creature Files: Predators will thrill young readers with facts about twenty different predators from across the globe. Each profile includes facts about the animal’s habitat, diet, and how fast it can run, fly, or swim. From knife-like claws, to lightning speed, these creatures are sure to spark the imaginations of animal lovers far and wide. Creature Files: Predators even includes a predator tooth necklace! In Creature Files: Dinosaurs, you’ll peer inside the jaws of these fearsome creatures, discovering what they really looked like, where they roamed, and what they ate, using many of the same tools that actual paleontologists do. Can you match the three replica teeth to the prehistoric mouths they belong to? Stunning illustrations and surprising stats bring the stories of these long-extinct beasts to life. Why are shark eggs called “mermaid purses”? What in the world are “skin-teeth”? Do sharks deserve the nickname “man-eater”? Find the answers to these questions and more in this action-packed book, which dives deep under the surface to explore the world of these astounding animals. Inside Out: T. Rex offers clues to understanding the most compelling and mysterious dinosaur of them all. Loaded with awesome illustrations and captivating text, a die-cut model within the book’s pages will take you inside T. rex’s body to reveal, layer by layer, how these giant beasts lived more than 65 million years ago. Alongside beautiful illustrations and photographs, an interactive die-cut model reveals the many rites of the Egyptian tomb: the golden burial mask, lucky amulets, linen wrappings, even the mummified body and preserved sacred organs. And when it comes to hieroglyphics, hidden burial grounds, and missing treasure, there’s always more to uncover. 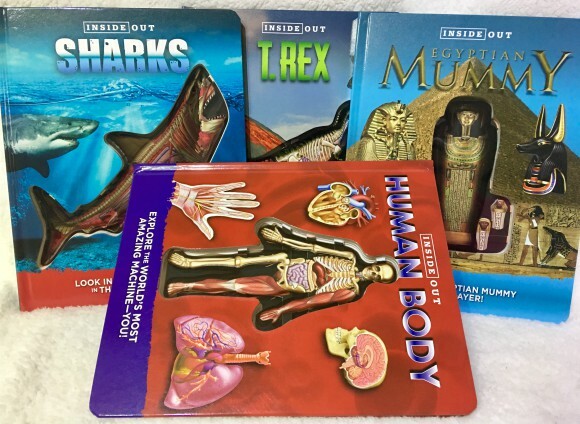 Inside Out: Human Body takes you on an incredible journey through the powerful muscular system, the "bone zone," the long and windy road of the digestive system, the blood-pumping circulatory system, the forty-seven-mile long nervous system, and beyond! A unique layered model of the human body serves as the center point of each section, revealing key body parts and functions, while entertaining and informative text explains how the body works.